Blogger to Coburn: run for president as "favorite son"
Tulsa blogger Michael Bates of BatesLine.com has penned a plea to Sen. Tom Coburn, urging him to file a presidential campaign here in Oklahoma as a "favorite son" candidate. Filing for president in Oklahoma started today, and closes on Wednesday at 5pm. The best hope for across-the-board (fiscal, social, and defense) conservatives is for another candidate to emerge, but it's too late (believe it or not) for another candidate to enter and compete effectively in the primaries. Filing deadlines have already passed for New Hampshire, South Carolina, Florida, and Missouri. Oklahoma, Ohio, Louisiana, and Michigan close filing this week. By the time we know the result in New Hampshire, even more deadlines will have passed. Although Iowa has no filing deadline (the caucus straw poll is not binding), a win there would require creating a grassroots GOTV organization ex nihilo in less than a month. But there is still a way for a "player to be named later" to become the Republican nominee. "Favorite son" candidates could file in each state, giving Republican voters a way to vote for "None of the Above" and to deny a majority of delegates to any of the currently active candidates, none of whom seem to have the right stuff to win the nomination, win the general election, and then steer the country decisively away from the fiscal Niagara Falls just around the next bend in the river. I'm asking you, Sen. Coburn, to run in Oklahoma's primary as our favorite son. Sure, any random Republican with the intention of serving as a placeholder for "None of the Above" could cut a check for $2,500 to put his name on the ballot. But Joe Random would have to raise huge amounts of money to publicize his reasons for running and to convince Oklahoma voters that he could be trusted with their votes. You wouldn't have that problem, Sen. Coburn. 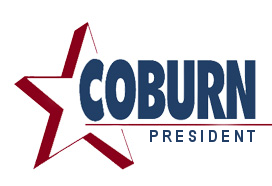 The media, both local and national, would give a Coburn favorite son candidacy significant coverage. Oklahoma Republican voters already know and trust you (your TARP vote notwithstanding -- an error, but well-intentioned), and they know you are not driven by a lust for power. And if a win in Oklahoma turned into a national groundswell for a Coburn nomination, the vast majority of Oklahoma Republicans and fiscal conservatives nationwide would be very, very pleased. If you should win the Oklahoma primary, as I expect you would, Oklahoma's 43 delegates would give you a seat at the table in deciding the outcome of a deadlocked national convention, helping to ensure that the Republican nominee is someone who understands the fiscal crisis that looms over our nation and who is prepared to act decisively to deal with it. Read the post in its entirety at this link.